Scientists obtained an image of the black hole in another galaxy. Image: Event Horizon Telescope collaboration. For years, scientists studied black holes, even though they had never seen an image of one. 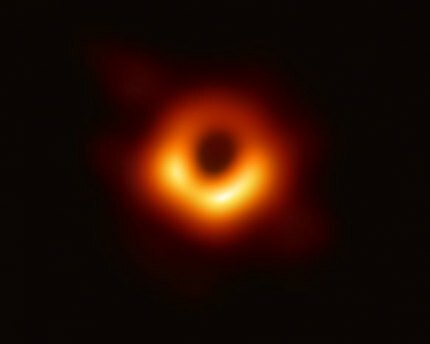 But last week, scientists from the Event Horizon Telescope Organization released the first image of a black hole, achieved by a network of eight radio telescopes. It shows the shadow of the supermassive black hole in the center of Messier 87, an elliptical galaxy 55 million light-years from Earth, according to NASA. This particular black hole is 6.5 billion times the mass of our sun, according to NASA. A black hole, by definition: A black hole is described by Merriam Webster as “a celestial object that has a gravitational field so strong that light cannot escape it and that is believed to be created especially in the collapse of a very massive star." How were black holes discovered? The understanding of this phenomenon grew and developed over the centuries. “Using Newton’s Laws in the late 1790s, John Michell of England and Pierre-Simon Laplace of France independently suggested the existence of an ‘invisible star,’” according to Hubblesite.org, the website for the Hubble Telescope. The two scientists calculated the mass and size an object needs to have an escape velocity greater than the speed of light. “In 1915, Einstein's theory of general relativity predicted the existence of black holes. In 1967 John Wheeler, an American theoretical physicist, applied the term ‘black hole’ to these collapsed objects,” the website explains. Why do scientists use the term "event horizon" when they discuss black holes? The event horizon is a black hole's "point of no return," according to NASA. Anything that comes within a black hole’s event horizon, "will be consumed, never to re-emerge, because of the black hole’s unimaginably strong gravity." How do scientists determine the size of black holes? First, consider that the size of the event horizon is proportional to the mass of the black hole, according to HubbleSite. "Astronomers have found black holes with event horizons ranging from six miles to the size of our solar system."